Years ago, I watched the movie Live Free or Die Hard which dealt with the hero, John McClane (Bruce Willis) versus a team of cyber criminals who were trying to bring down the country’s financial, transportation and power infrastructure. At that time the idea was scary but seemed farfetched; these days, it seems a lot more plausible. Cyber attacks are increasingly common these days, from almost daily reports of department stores being hacked to a massive breach of security of a major motion picture company. Many tech experts predict an ever increasing likelihood of cyber attack. Although economic collapse is still high on the list of possible risks, I now believe the risk of cyber attack crippling or at least hampering an area of people’s lives is highly possible. When personal financial information was stolen during the recent Target breach, a lot of people found their accounts frozen and inaccessible. Many were unable to use their credit or debit cards for several days. If you had all your accounts in one place, you could potentially be denied access to your own money for several days. The threat could be even worse should the power grid be compromised. Use cash instead of credit or debit cards. I know this sounds inconvenient, and almost sounds ancient, but to me, cash is still king – your personal information won’t be breached, and your purchases are not tracked if you went back to using cash. Plus, since you only have a certain amount, you will not be likely to overspend. Use an RFID blocker Because a lot of our information are stored in RFIDs, your cards can be stolen from afar using RFID readers. These cards block RFID readers from scanning your driver’s license, debit or credit cards other RFID cards. When shopping online, use a credit instead of a debit card. Credit cards offer more protection than debit cards if your information is stolen and you have to deny the fraudulent charges. Have a cash emergency fund in a safe place. Find ways to increase your fund. Tell only people you trust, but don’t mention it to anyone else. Have a backup way to pay bills. If you pay bills online, double check a few days after you set up payments to make sure the payments went out without any problems. If your payments did not go out properly you cannot use the “bank glitch” as an excuse. You may have to mail your payments late or pay at authorized payment centers such as the grocery store’s customer service center or the utility offices. Keep a book of stamps, as well as extra checks in case you do have to mail checks. Many households no longer use checks but do everything online. Guard your passwords carefully and do not store them online. Periodically change your passwords using more complex combinations of characters instead of easy ones. Avoid giving out your social security number and other personal identifying information unless absolutely necessary. Every doctor’s office asks for it, but they don’t need it – most health plans have their own policy and group numbers. Politely decline and insist they use the card number and not your social. Every cashier tries to ask for a phone number even on a cash transaction. I always refuse nicely. Do not click on unsolicited email links, attachments etc. If you receive email from your financial institution, do not click on the link within the email, instead, log in directly to their website, or call the 800 number to find out the issue. Have a plan on how to get out of your building. I’ve been in the office when power went out and I got stuck in a crowded elevator for several minutes. It is not an experience I’d care to repeat. You need alternate routes to get home in the event of an emergency. Backup your projects on a regular basis. Have an office emergency kit in your desk: water, food, first aid kit, cash and comfortable shoes are a few items you can start with. Follow your office’s IT protocols regarding online security and confidentiality – you don’t want to be the one that inadvertently contributed to a data breach. Store a minimum of two weeks worth of water and food. Even if you lose access to your bank accounts, your family will survive. Prepare for a power outage. Have a backup source of power such as a generator, solar chargers, and backup cooking alternatives. Backup your documents and photos – don’t store everything online. You can store your documents in your Grab and Go Binder, I know photos are too numerous to have hard copies of all of them, but you can keep copies of the precious ones, but back up the rest in a flash drive or an external hard drive. Backup your cell phone contact list in a hard copy. If you are not able to access your phone contacts for any reason, you can still contact them via a land line, by mail or another network. If you live in an apartment building, know alternate ways to get into your unit if the remote control garage or gate opener does not work. If you have a newer TV that is connected to the internet, you need to be aware that information goes back and forth. Your TV could be watching you and collecting data about you without your knowledge. 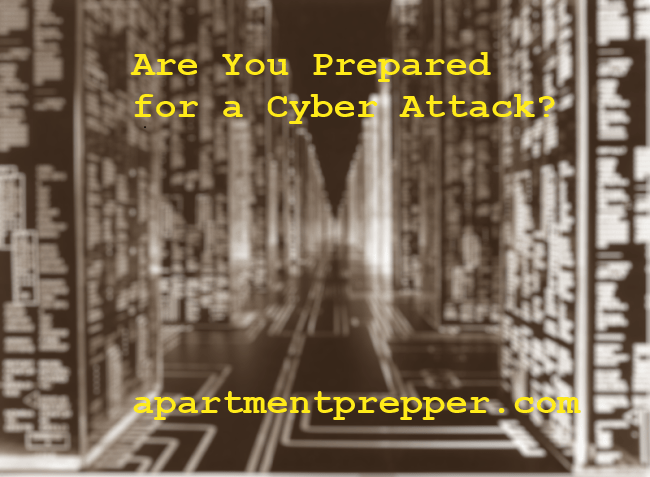 As with other emergencies, there is no way to predict when a cyber attack will occur. All you can do is be prepared for emergencies.